In the previous five years WMEAC staff and the Policy Committee have worked in various capacities to first understand the legacy environmental issues posed by former Wolverine World Wide Tannery site in Rockford, MI on the banks of the Rogue River and second to facilitate communication and investigation/remediation activities between the Concerned Citizens group in Rockford (who first brought the issue to attention), the MI Department of Environmental Quality, the City of Rockford, and Wolverine. With the changes in staff and loss of institutional knowledge regarding this issue over the last year, the Policy Committee has worked to get an updated perspective and understand the current needs of the parties involved. As such we have talked with researchers from GVSU, members of the Concerned Citizens group, The Department of Environmental Quality Grand Rapids Office, and helped organize a water issues town hall meeting on behalf of the MI Environmental Council. From that process, we learned there are indeed real concerns related to contamination of surface and groundwater sources and that WMEAC was still needed as a mediator between the parties, a facilitator of information sharing, and to continue applying pressure towards the progress of Wolverine and DEQ in their Tannery site investigations and remediation plans. It is worth noting that much of this work occurred prior to the recent revelations of the abandoned dump sites used by Wolverine which have contaminated drinking water sources for dozens of residences and potentially schools around those sites. There has been a great deal of media coverage of that contamination and there are many governmental entities now involved including MI Dept. of Health and Human Services, MDEQ, Kent County Health Department, City of Rockford, and Plainfield Township. In addition, Wolverine has claimed responsibility and has thus far paid for water filtration, further investigations, and dump site cleanups. With so many levels of oversight, it is the Policy Committee’s recommendation for WMEAC to stay primarily focused on the original Tannery Site issues to ensure the DEQ and Wolverine commit to their original promises of a more comprehensive site investigation and eventual remediation there. We would ask the Board to adopt a formal position requesting enhanced and long-term groundwater monitoring at the Tannery site including for Ammonia and PFC’s in the groundwater and remediation of waste or any surface or groundwater contamination by Wolverine and the DEQ. We see the value of this step being to spotlight the issues at that site and supporting the efforts of our community partners. 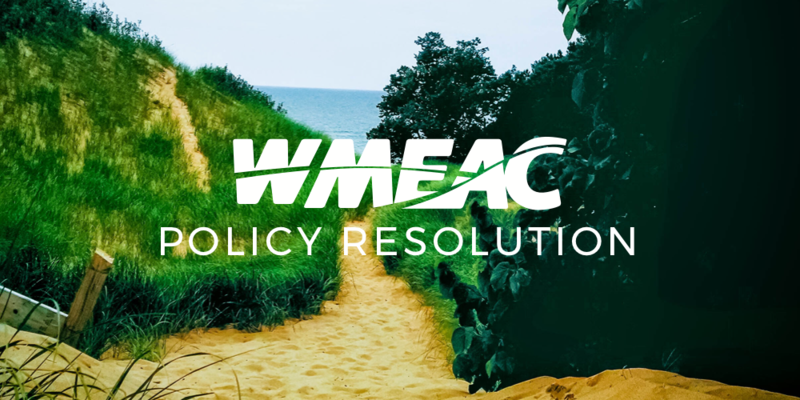 The WMEAC Policy Committee will continue to monitor the situation and report back to the board with any changes in focus or actions that might be needed.